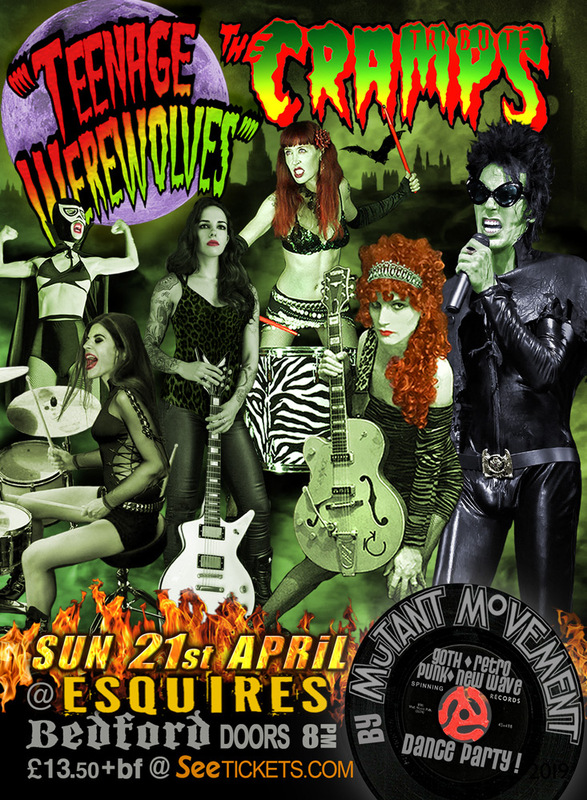 “Teenage Werewolves”, the worlds best CRAMPS tribute, pick up where the wild & wackiest of them all, “The Cramps” left off. After the death of rock’s most-uninhibited singer Lux Interior in 2009, the Teenage Werewolves were born by animated singer Jack Atlantis (also born in the same town as Lux Interior). Teenage Werewolves cut their teeth on L.A’s most historic & unforgiving stages like the Viper Room & the Whisky a Go-Go. This “Psychobilly-Circus & Punk-Rock-Theater” has a visually-irresistible stage-show including show-girls, shakes, mistakes and near-misses. They merge John Waters & Russ Meyers overtones to create an action-packed, freak-out show. Adorned by hard-core, casual and even non Cramps fans alike, including notable TW fans such as David J (Bauhaus and Love & Rockets), (New Wave legend) Gary Numan, Jay Aston (Gene Loves Jezebel) & Josh Homme (Queens of the Stone Age). Teenage Werewolves are dolls of the Los Angeles press & L.A’s most anticipated Halloween show; now they have a permanent band & base in London to tour England annually! “Your Cure for the Cramps”, just may save your life. Followed by Mutant Movement Dance Party of Punk, Retro, Goth & New Wave with a dash of ghoulish grooves in for good measure for all you freaks, finks and weirdos!